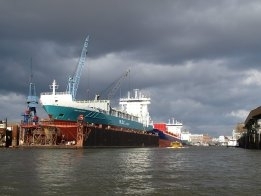 Ships with scrubbers, the exhaust abatement technology which removes sulfur from ships' emissions, represent a tiny part of the overall orderbook for new ships even though the numbers of units on order continues to rise. According to marine analyst IHS Markit, the scrubber order book stands at 388, up by 3.5% over the previous figure reported by Ship & Bunker. A tally of 375 scrubbing units was reported by IHS Markit in September up from 358 in July. The latest report from the analyst shows that cruise ships and ro-ro/car carriers dominate the scrubber orderbook accounting for just over half of the orders with ferries and bulk carriers at just over 10% each. In terms of size, it is the mid-sized vessels (20,000 gross tonnes (gt) to 50,000 got) which are the biggest recipients of scrubbing technology. But from the standpoint of new vessel orders, ships to be fitted with scrubbers account for 1.5% of the global fleet orderbook, the figures show. For orders this year, the percentage moves up slightly by a percentage point to 2.5% of the orderbook. Spanish oil companies make similar assessments of changes to local market. To boost low sulfur output ahead of IMO2020.